Note: This will not delete your articles from the Helium Publishing dashboard. It will simply unpublish them from the live microsites. As a result, your content will not generate ad revenue nor will it be searchable on the Web. Note: If you intend to remove your articles, you may want to download it first. 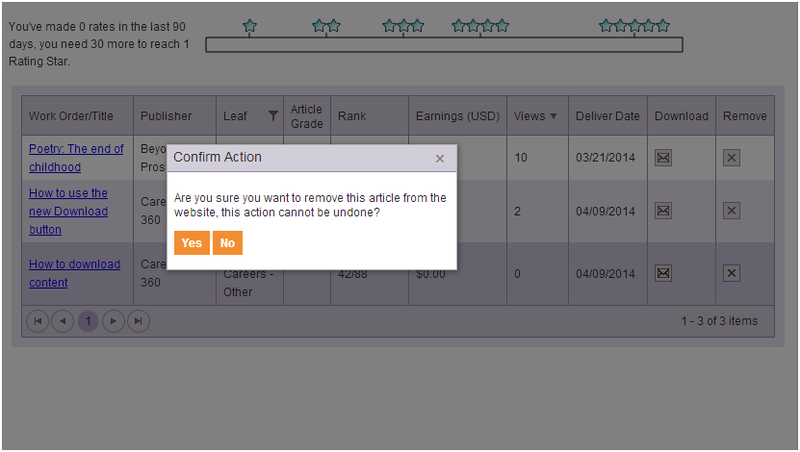 Find the article you’d like to remove from the 360 microsite and click the Remove button. You will be prompted to confirm that you’d like to complete this action. Note: If you choose to remove an article, the action cannot be undone. If you delete something unintentionally, however, you can still find the text within your Completed Work.